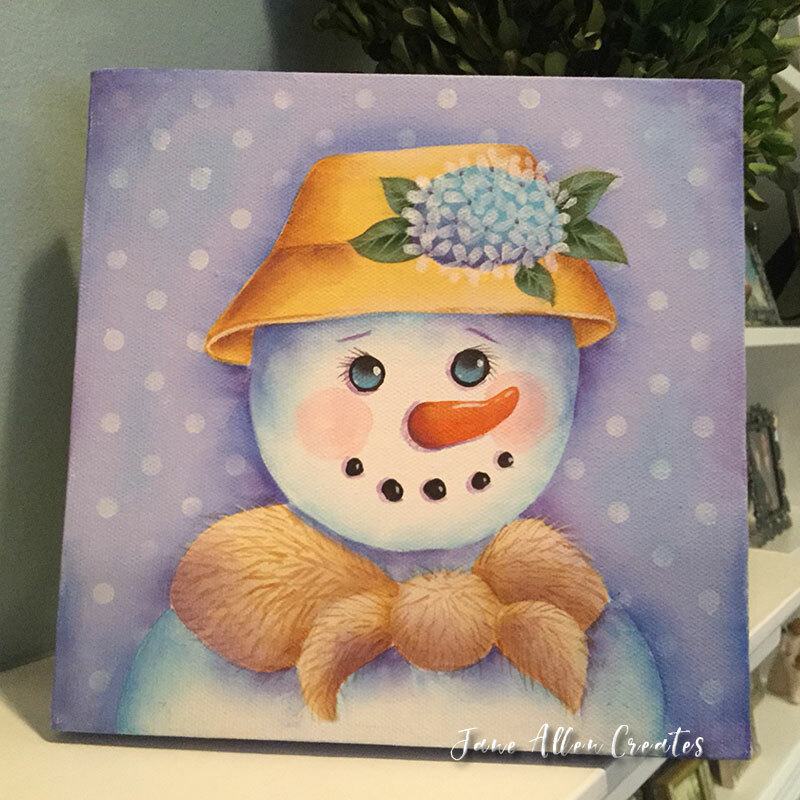 This sweet snow lady is painted on an 8″ x 8″ canvas, but you could paint this on any surface. For this project I used the following DecoArt colors: Buttermilk, Evergreen, Grape Juice, Hauser Light Green, Hauser Medium Green, Honey Brown, Indian Turquoise, Moon Yellow, Raw Sienna, Sapphire, Soft Black, Soft Lilac, Spice Pink, Spice Pumpkin, Tangerine, and Warm White. Remember this is your project so change the colors to your favorites or to the ones you have on hand. Start by basecoating your background Soft Lilac, snowlady – Warm White, hat – Moon Yellow and shawl – Buttermilk. Stencil Warm white dots on background using Tracy Moreau’s Stencil – Polka dot Background (www.tracymoreau.com). Add Soft Black – eyes and mouth, a Spice Pumpkin – nose and Hauser Medium Green – leaves. Shade the snow lady with Indian Turquoise, and her hat and shawl with Honey Brown. Float the lower half of the eyes with Indian Turquoise. Shade around figure with Sapphire. Also, shade under her hat and down sides of her face, under her chin and around scarf with Sapphire. Reinforce shading in hat and shawl with Raw Sienna. Float Evergreen down center of each leaf to form vein shadow. Add Buttermilk highlight on top and brim of hat and Warm White on Shawl. FLoat Hause Light Green on each leaf against center float and opposite outside edge. Using thinned Spiced Pink paint cheeks. Dry brush Indian Turquoise lightly here and there on background. Float Indian Turquoise on some of the light green on leaves. Reinforce floating on snowlady and background with Grape Juice and also on her hat and back of her nose. Float light wash of Grape Juice on shawl. Using liner and thinned Grape Juice line down and under each eye , nose and coal for mouth. Also paint eyebrows. Highlight top of nose with Tangerine. Use Hauser Light Green + Warm White to paint veins on leaves. Paint high lights on eyes and mouth with Warm White. Line brim of hat and paint hairs on shawl with Raw Sienna. Base hydrangea with Indian Turquoise and shade with Grape Juice. Highlight nose with Warm White . Also paint Warm White hairs on Shawl in light areas. Paint flower petals with Warm White and centers with thinned Grape Juice. Shade outside edges of canvas with Grape Juice. Paint Buttermilk line on brim of hat. If you like doing this project check out these snow lady designs. Gretta – In the book “Jane & Amy Celebrate Christmas”. Thank you so much for sharing this sweetie! Thank you Roxanne, I hope you enjoy painting her. I just finished 3 friends on a window. Love that design! Thank you Sally, that is one of my favorites. Thank you so much for this. She is so cute. Thank you Jane..always love your snowladies! your snow lady is adorable a breath of Spring in needed Tired of cold and wet. Thank you for sharing…. Thank you Mary Elizabeth, enjoy creating her. She is adorable!Thanks for sharing! You are welcome Mitzi, enjoy! You are welcome Effie, enjoy!